At first it was a confidence thing. Chase Malek was on the football team as a freshman. Having dealt with some weight issues to that point he really just wanted to feel better about himself. As the numbers on the bars increased and the number on the scale decreased, he did. 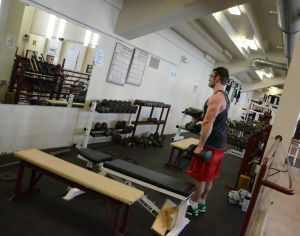 Now the Northfield High School senior centers his daily routine around lifting weights. He recently competed in his first body building show. He feels good. As is the case with an increasing amount of high school athletes, Malek takes supplements in an attempt to help his body make gains and improve its efficiency. Sophomore Travis White has been lifting to help prepare for wrestling season and has felt the physical benefits of his post-workout supplement. The purchases Malek and White make are part of an$18 billion supplement industry, which has penetrated further into the high school athletic world than ever before: According to the American Medical Society for Sports Medicine (AMSSM), between 24 and 29 percent of middle school and high school athletes are using ergogenic supplements. While their actual benefits are debated and their use is discouraged by the Minnesota State High School League, they represent a legal option that more and more athletes are taking. A recent University of Minnesota study shows that illegal options too are being used by more Minnesota youth than previously supposed: Of more than 2,700 middle school and high school students from Minneapolis and St. Paul surveyed, 5.9 percent of boys and 4.6 percent of girls reported using steroids, which is a felony without a prescription. “The use of muscle-enhancing behaviors is substantially higher than has been previously reported and is cause for concern,” the article concludes. The lack of evidence is based in large part on the structure of high school athletics: Coaches, trainers and teachers see students for parts of days over years where their bodies are naturally changing at huge rates. Knowing exactly what students are putting in their bodies and what changes it might cause over that time span can be difficult. Current activities director Tom Graupmann said he hasn’t had any cases of steroid use come to his attention in 12 years as activities director. In 2005 Minnesota passed a law increasing the penalty for those caught illegally distributing steroids to a 15-year felony and a fine of up to $100,000. Selling steroids to a minor was bumped up to a third-degree controlled substance offense, subject to a 20-year felony and fine of up to $250,000. In essence, further emphasis was placed on curbing distribution as opposed to catching minors using steroids, which – as attempts in several states have shown – can be an extremely expensive and unproductive effort. For example, in 2007 the New Jersey’s state high school athletic association became the first to test high school athletes for performance-enhancing drugs. In a little more than four years the state and the association spent $400,000 to test about 2,000 student athletes. Of those 2,000, one tested positive. Similar results played out in Texas and Florida, which shuttered its testing program in 2009 after just one positive test the year before. That data comes from a give-and-take with state-wide student surveys given once every three years. Currently those surveys don’t include any questions explicitly asking about steroid or supplement use. The way it stands, steroid use is down the list of worrying behaviors behind several others, including alcohol, marijuana, and other chemical use, Redman said. “Those are more concern for our young people than steroids are,” Redman said. While there are several substances on any list of concerns for young people, the University of Minnesota study posed a potential link in steroid use increases to media images, including a shift in how body sizes and shapes are portrayed. The study’s findings that 90 percent of boys and 81 percent of girls were “exercising more to increase their muscle mass” supports that idea, and it suggests the prevalence of “doping in professional sports” may lead kids to think it’s normal. Role models who are physical outliers are all over, and studies have long made the correlation between the unrealistic body images portrayed in media messages and poor body image for youth. With television and Internet access at higher rates than ever, the saturation of those images is borderline omnipresent. Many point to the Internet as well in its ability to give youth access to supplements and more illicit materials: A simple Google search for “steroids online” brings more than 31 million results. Being bigger, faster and stronger can be the means to any number of ends for a high school athlete: There can be the desire for an athletic scholarship and the chance to play a college sport. There can be the desire to be better at the high school level and win a section or state title. There can simply be the desire to make the team. All of those results-based goals represent a viewpoint of sports that many in Minnesota are looking to move away from. That ultimate goal underlines a major preventative stance: If student athletes’ desire to play fair in athletics overrides their desire to do anything to win, they may be less likely to turn to substance misuse or abuse. The hope is for the athletic culture to not reward the things that substances can potentially help attain.